19. Barclay's bank and the railway bridge. A view down to the railway bridge, which includes part of Barclay's bank and a whole bunch of scaffolding as well as the new lamps, which are all on the left side of the street here. The picture was taken from in front of the Royal Bank of Scotland. 20. Beyond the railway bridge. 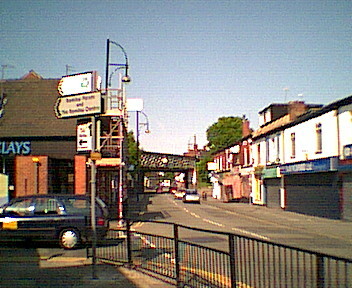 A view of Stockport Road from the shadow of the railway bridge. 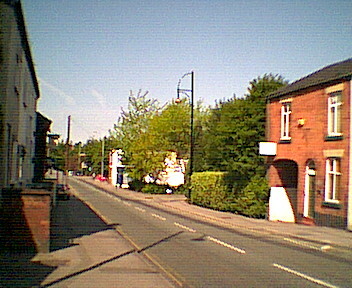 The red car on the right side of the road also appears in the next picture as a reference point. 21. 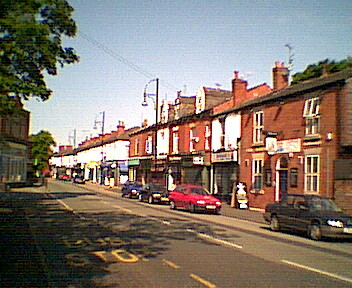 The sunny side of Stockport Road. As for 20 but taken a little further west (note the red car). 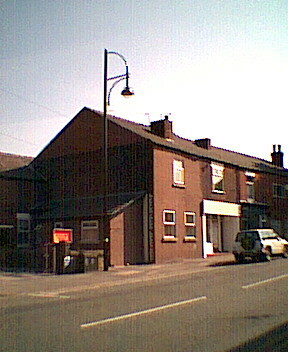 The new lamps are all on the sunny (north) side of the street here. 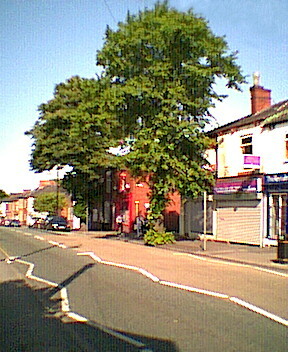 Not a lamp post shot but a fine view of the big tree at the corner with Hill Street  although the new lamp at the Methodist church can just be seen at the left side of the picture. 23. Running out of new lamps. 24. Almost the end of the zone. There is nothing spectacular at the western end of the new lamp zone yet. 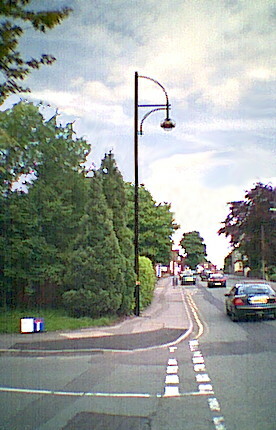 This is the penultimate new lamp post, which has been topped, painted black and striped with gold. 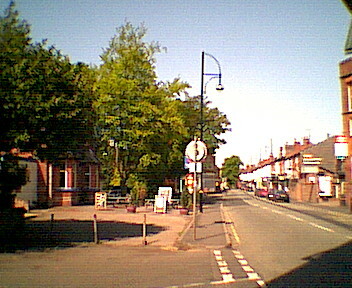 The 2 shots were taken going west (left) and going east into the village (right). 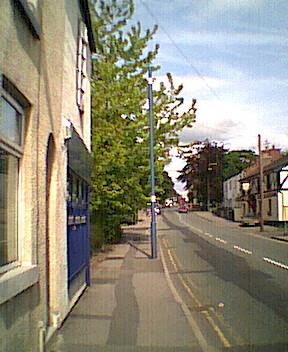 More shots of the new lamp post at the western end of the new lamp zone (first seen in picture 10, left). All of the others have been topped and painted black with a gold ring but this one remains incomplete. Has this one been forgotten? Or are the cowboys-in-charge waiting for the building work opposite to be completed before they place a matching post opposite this one and give them fancy tops? 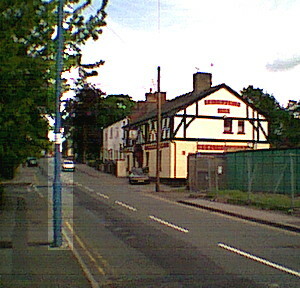 The picture on the right shows the position of the lamp (highlighted) in relation to the Friendship Inn and the village's building site  part of the fencing for the site can be seen at the right of the picture.